It's been pretty chilly around these parts the past couple weeks, and while THIS week is thawing out nicely, I know fickle nature is bound to come right back at me with the winter chill in a week or so. It's this kind of nonsense that makes me bound and determined to move south, people! Anyway, as naturally cold reptile of a human being, I have a hard time dressing for winter runs. Logically I know that the act of running will warm me up, but I dread those moments on the street corner waiting for my GPS watch to connect to satellite and I'm not running yet and I'm NOT. TOASTY. Which is why I have a bad habit of over-dressing for winter runs and getting hot. And then I remember that I over-dressed yesterday, so on today's run I won't make that mistake, but then the conditions are even more frigid than the day before and I've under-dressed and never quite warm up! Blast! My point is that I recently read somewhere that you should dress for a run like it's 10 degrees warmer outside than it actually is, and this rule has been helping me a lot lately. If you too suffer from Oh God Why Isn't It Summer-itis, maybe it will help you too! Too cold and potentially icy for the outdoors. On this particular day it was 19 DEGREES and SNOWED during my run. So I'm kinda proud of myself for doing it, but also, WHY IS WINTER A THING. - Darlin' Rae is a solid run-streak coach. 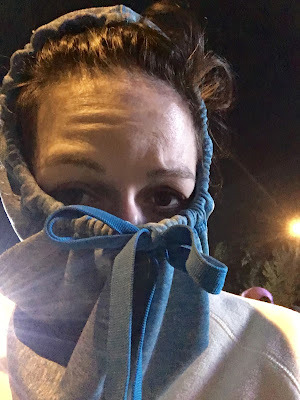 - Sparkly Runner attends the WDW Marathon Weekend blogger meetup. - Pixie Dust Savings selects the Magic Kingdom's best snacks. - WDW For Grownups takes a close look at the Prime Time Cafe in the Studios. - Living A Disney Life debates the merits of Epcot's Festival of the Arts. - The Tomorrow Society closely inspects the lovely Animal Kingdom Lodge. I run into the problem that on the 6 40 degree days a year we MAY get, I have absolutely no idea how to dress for them. Nor do I even HAVE any appropriate running for that kind of insanity. And why should you? That kind of insanity is for CHUMPS.